Double double, toil and trouble, if you want to be a witch... move to Romania. The Romanian government now officially recognizes witchcraft as a legal profession. The recognition is part of a new tax law designed to bring in more funds and reduce tax evasion by citizens that make their living combining eye of newt with toe of frog. Belief in superstition and magic is apparently common in Romanian culture. This means that fortune tellers, witches, and astrologers aren't widely considered to be lunatics or scammers like they are in other regions of the world. The Romanian government's listing of witches in the country's labor code forces them to pay 16% self-employment tax and contribute to health and pension programs like every other self-employed citizen. They'll have to pay in actual money too, not enchantments or creepy animal parts embalmed in jars. Some witches are happy about it, while others are not. 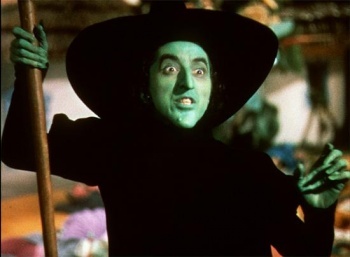 One bad witch, who may or may not be wicked, told the Associated Press: "What is there to tax, when we hardly earn anything?" On the other hand, some noble members of the witching community were seen throwing corn into a river to celebrate official government recognition, which is coincidentally what Escapist staff does when we're happy too. One of the good witches was also seen chanting a spell for a good harvest, using a jar of charmed river water, a sprig of mistletoe, and a candle. Romanian government officials should watch their backs, because certain unhappy witches are planning to retaliate against the law. "Queen witch" Bratara Buzea told the AP she'll be cursing those that passed it with a curse concocted using cat feces and a dead dog. I like the good witch's ingredients much better. "My curses always work!" she said. Something tells me it would probably be more effective to just put the feces in a brown paper bag and leave in on a Romanian official's doorstep.